Hello Sarkar is Nepal’s Government idea, the idea which makes a relationship between people and government more closer and deeper for positive changes in the nation. It is a fully functional portal of government monitored under the Office of Prime Minister and Council of Ministers and it has solved a lot of issues and problems of the people. Hello Sarkar is all about the Nepalese people speaking up about their problems. People can speak about their problems such as unsatisfied service provided by the governmental bodies, or a criticism or some advice and suggestions on that. The problems are directed to the concerned authorities and department of government. Citizens can clearly talk about crimes and criminalities, corruption and flaws, relief and rescue, and other circumstances of public concern to the Hello Sarkar. By now, we came to know that this service is made available for the public welfare. It is really a nice platform where the public can complain about the government services. So, it must reach to the people easily, all should get the access to it. So here is how to contact. You can ring the Hello Sarkar with a toll-free number 1111 to register the complaints. The call center service is available from the morning 7 am till the night 9 pm every day. Text messages can be sent to 1111. Most of the Nepalese people use cell phones and mobile nowadays. 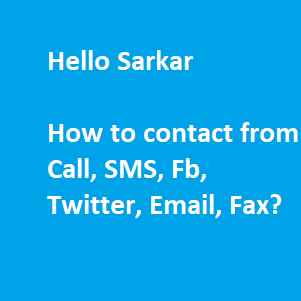 So it is not that hard to dial or text concerned words to the Hello Sarkar. You may also give a call to the Office number: +97714211087 of Hello Sarkar. Use Fax number 1100 to fax about your concerns with the government and its facilities. The employee appointed in the Hello Sarkar will report your issue and complain to required heads and management through a computer system and other communication systems available. This service was launched on November 3, 2011, while the service setup since December 14. Anyone having an email account (or create an email account. Creating email is easy.) can email their problems to sarkar through this Email address [email protected]. For people who are using Facebook and Twitter, official Facebook page and a Twitter page of Hello Sarkar are also available. Simply, go to facebook and search for. Search same on the twitter. And Have your say over there. Hello Sarkar is a boon and the great opportunity for Nepali people. So people should not be misusing and abusing it. It can be compared to a tool that connects the people and a government, a bridge which joins citizens and concerns bodies of the nation. The other benefits people and a country have are that it increases the productivity and progresses the development pace of the new as well as old resources and infrastructures. So, it is better to share this idea with the family, friends, neighborhood, �and the Nepalese circle to grow the positivism and awareness about the Hello Sarkar among all.